We researched the biggest economic city of India, Mumbai. It is located west coast of India, which was used to call Bombay. This is the second time we researched this city since we last did in 2004. 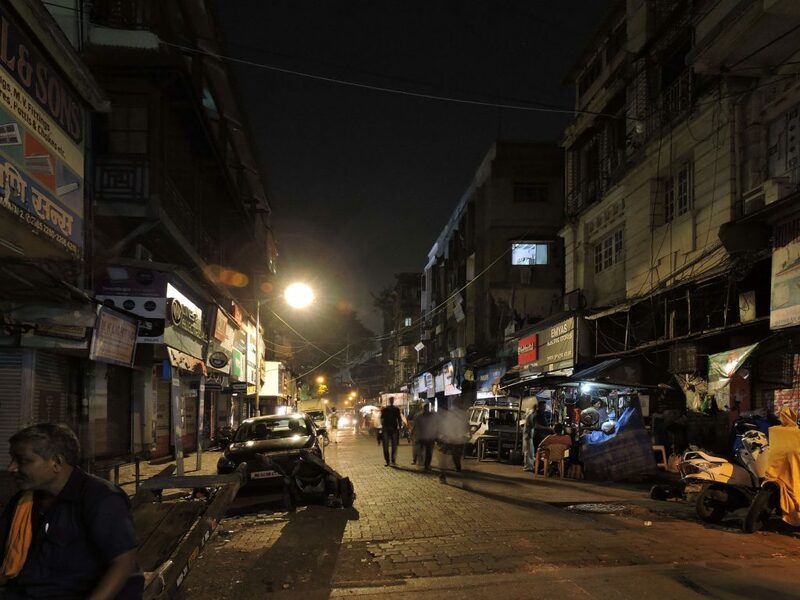 The goal of this research is to compare how its architecture and lighting have developed, and to compare with Navi Mumbai (New Bombay) developed as a new city of Mumbai. Dhobi Ghat is an outdoor laundry with more than 100 years of history. It is used as a laundry in the daytime, though people lived there and felt a sense of life in the nighttime. The contrast with the skyscraper in the background is very Indian. The building in front of the station. Building was carefully lit up with orange color. Arriving at Mumbai hotel after the sunset, from the taxi on the way to the hotel, I only saw street lights that lit the street, and the city that was on the background looked dark and sunken. We expected that it was developed like China where a number of buildings lit up, but there was no building that was illuminated. The situation didn’t change even in the city, with only seeing street light illuminating the building a little. Entering the central part of the city, the horning sound is flying constantly. As the taxi moving slowly, we saw many people doing something on the street and created strange atmosphere. It’s was not like attracting and energetic lighting that gives atmosphere of Southern East Asia, but it was impressive to see many people doing something relying on only dimming street light. 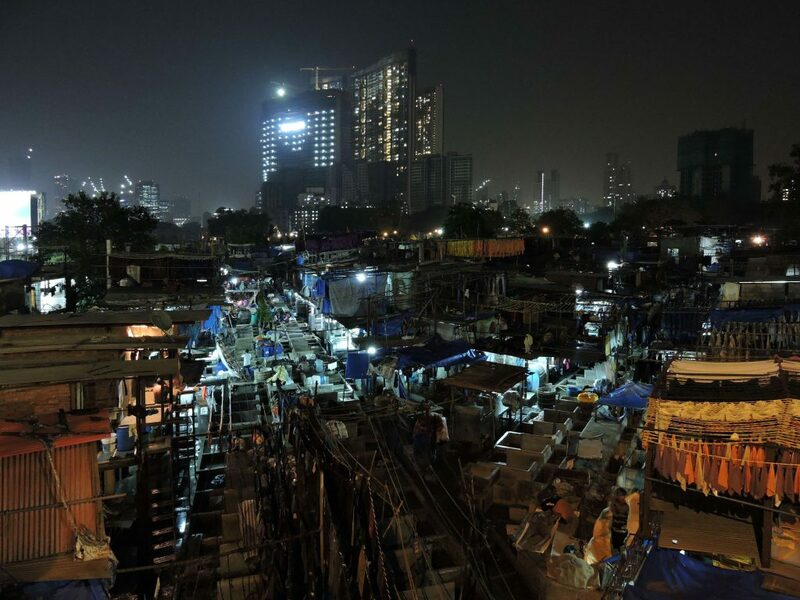 We saw few changes from last research, and it seemed Mumbai had not been developed much. There are a few buildings that exist as landmarks in Mumbai. India Gate which was built to celebrate the visit of Kind of England in 1911. In front of that, there is world leading Taj Mahal Hotel. Chhatrapati Shivaji Terminus which was registered for world heritage in 2004. We researched Hajj Ali Mausoleum, the holy ground for Muslims. Only lights we could see there were street lights, and there were only few illuminated building that gave solitary impression with window pane shining through. Buildings as landmarks were illuminated and characterized the town of night. 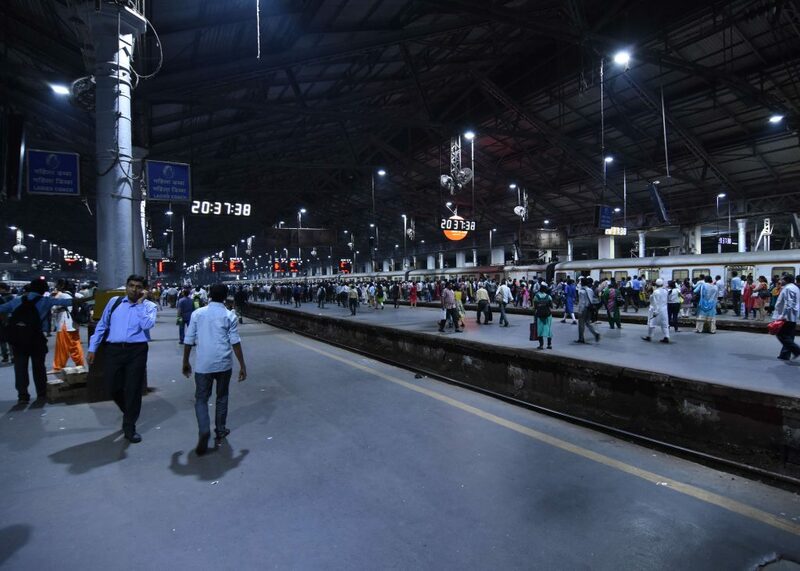 LED was used for India Gate with orange color, and color lighting with motion was used for the station. In front of the station, there was a building that reminded colonial period, and the lighting was carefully designed with hood to cut the glare. Hajj Ali Mausoleum floating on the sea used flood lighting of mercury lamp for illumination. It was not so impressive, but the road approaching the shrine that is in the sea was lit up with sodium that performed as a focal point with the different color temperature. 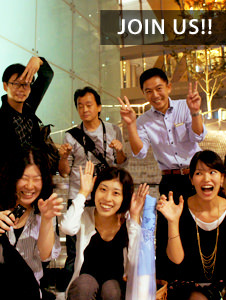 We thought the dark sunken sea in the background and rarely bright night view of the city were also important elements. We can see the sunset in the evening, and the scenery gradually changing to night is very beautiful. 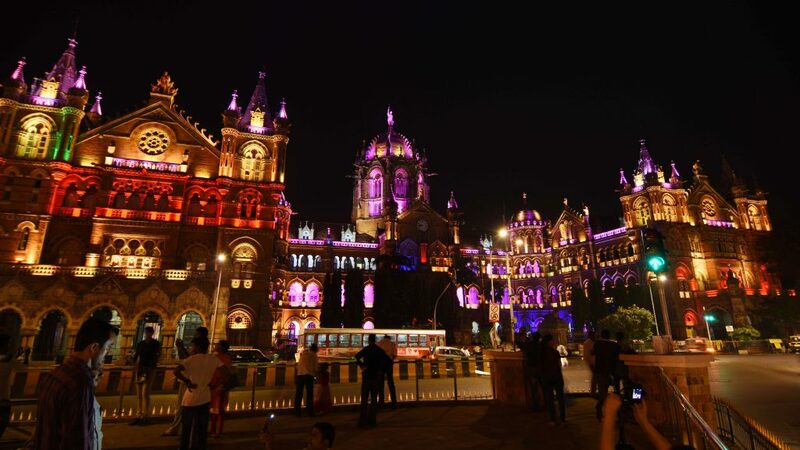 Chhatrapati Shivaji Terminus was built in 1887 and registered for world heritage in 2004. Its appearance in the daytime is very massive and designed in detail, but it looks like theme park using color lighting in the nighttime. Orange colored flood light evenly illuminated the India Gate. 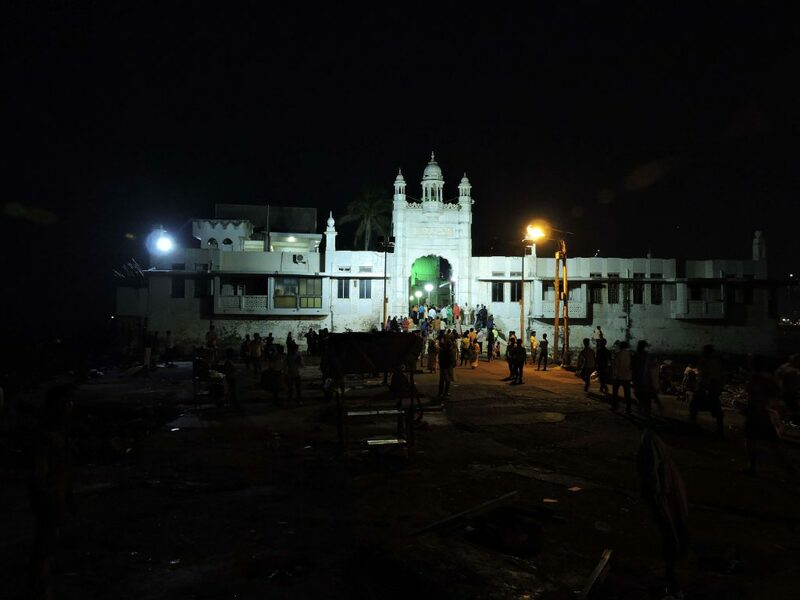 Inside the gate, there was a white spot light that illuminated the roof. Approach of Hajj Ali Mausoleum. Approach was lit with sodium lamp, and Mausoleum was lit with mercury lamp. The appearance of Hajj Ali Mausoleum. Many people gathered in the floating mausoleum even at night. It was lit up with the flood light of mercury lamp. 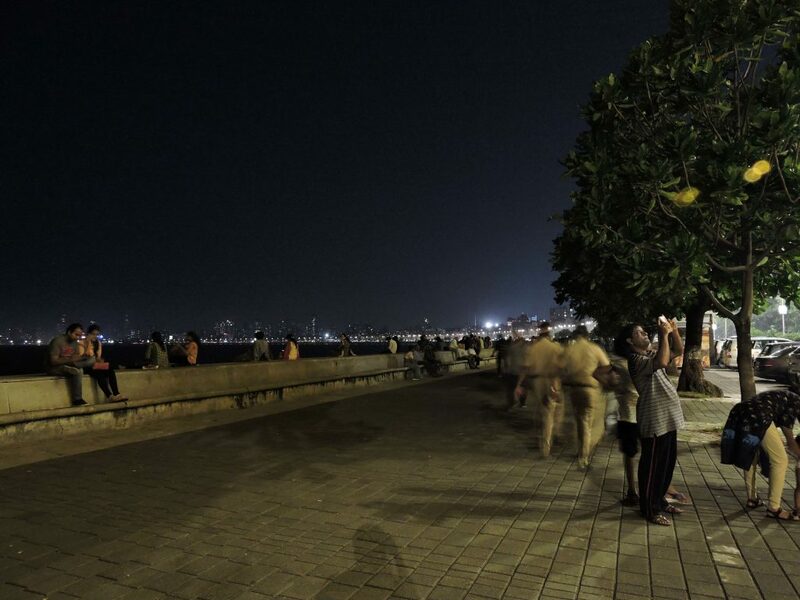 Gulf road called Marine Drive is a resting place for many citizens in the evening. The stride length along the revetment is 13 cm, and there were people walking and enjoying beautiful sunsets, couples, and many kinds of people. On the 50m wide road, including sidewalk, there were pole lights (H=12m) set up in about every 40m. Lighting fixture used LED. There was no lighting on sidewalk. Because it’s the main road, the lux level of roadway was about 25-70lux, and color temperature was about 4000K. It felt brighter than the other roadways around, which had 20-30lux. The lux level of sidewalk was about 5-15lux, and vertical illuminance level in the dark was less than 10lux, and we were only able to see person’s face a little. Trees were planted in between sidewalk and roadway which was comfortable darkness for bright roadway. 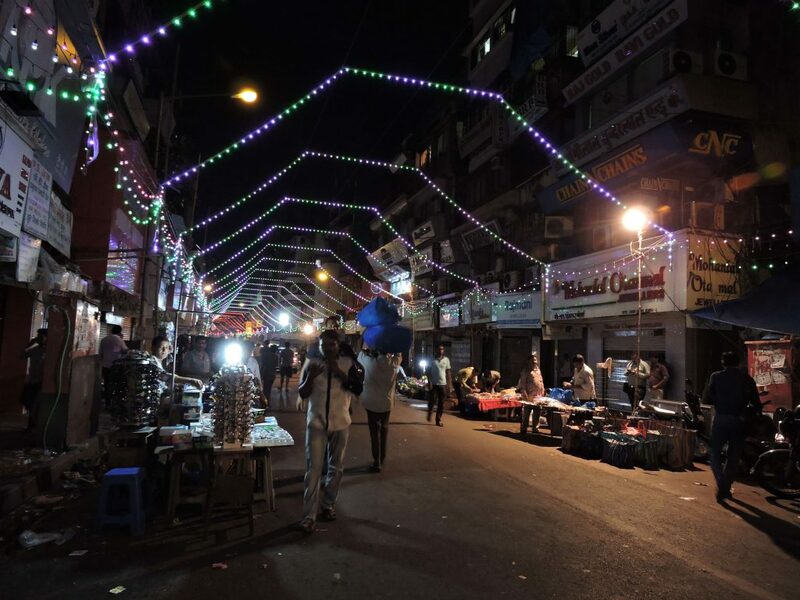 Around Mumba Devi Temple, market put out a store on the roadway that is about 9m wide, and it was flourished. It seemed like pedestrian at first, but the traffic of cars and motorcycles were very intense, and car horns were echoing constantly. Pole light with sodium lamp is was set up in 7m pitch in staggered arrangement, and the lux level was about 10-30. Many stores did not have lighting, and they were operating only with the street lights. Some stores were too dark to see what they were selling. There were a few stores that used fluorescent lamps or light bulbs so that we could see the items that were sold. 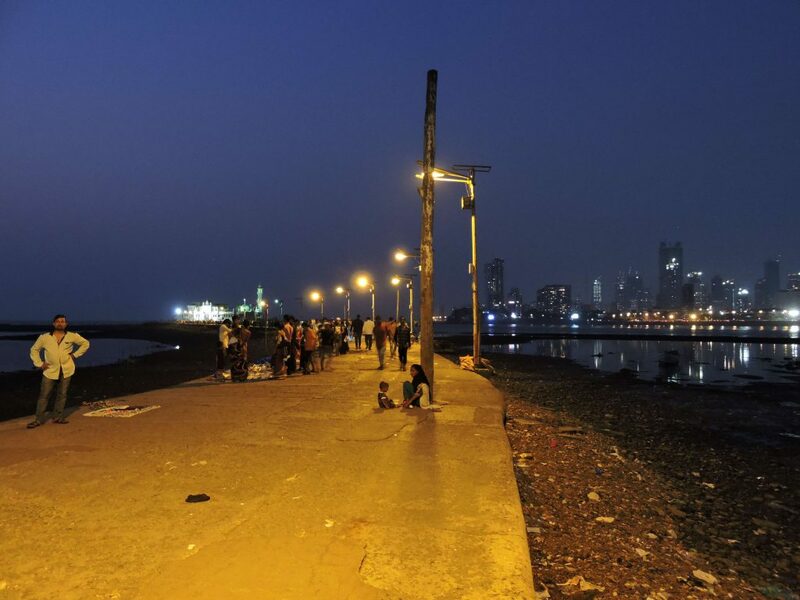 Sidewalk of Marine Drive. Sunsets and moonlight looked very beautiful. Bazaar around Mumbai Devi Temple. People are putting out stores under street lights. There are only street lights, and we don’t see signage or lightings in the store. 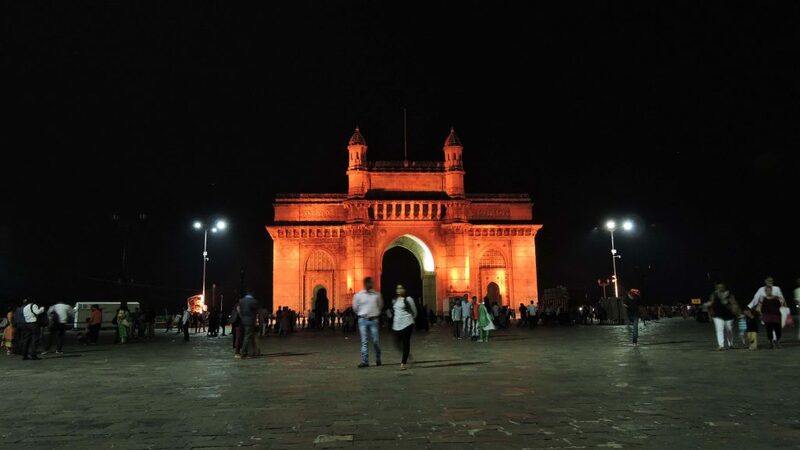 In Mumbai, lightings usually fulfill functions, but not to enjoy night views. There are only lightings for functional necessity just like turning on lights when it’s dark. Street light seems to be time operating turning on at 6:30 pm. That time is when Mumbai sunsets. Then, it gradually starts getting dark. Road illuminance was about 10-30lux. Same for indoors. With brilliant facade lighting, Chhatrapati Shivaji Terminus platform is constructed with a large roof of 80m wide and 250m long. 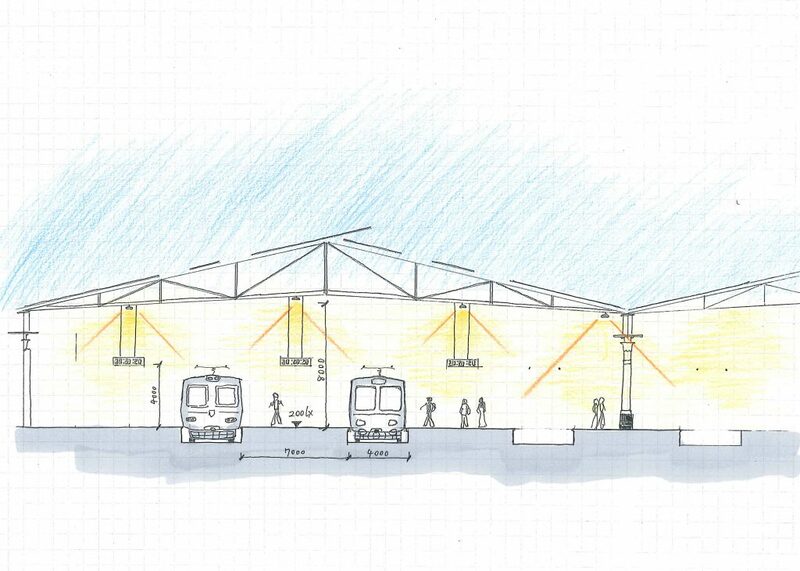 A large roof had a skylight that kept the brightness of the station using the daylight. Lighting was wide angled high power LED. Its height is about 8-9m to match with the beam. It is set up on grid in of 8m pitch from front to back and from side to side. 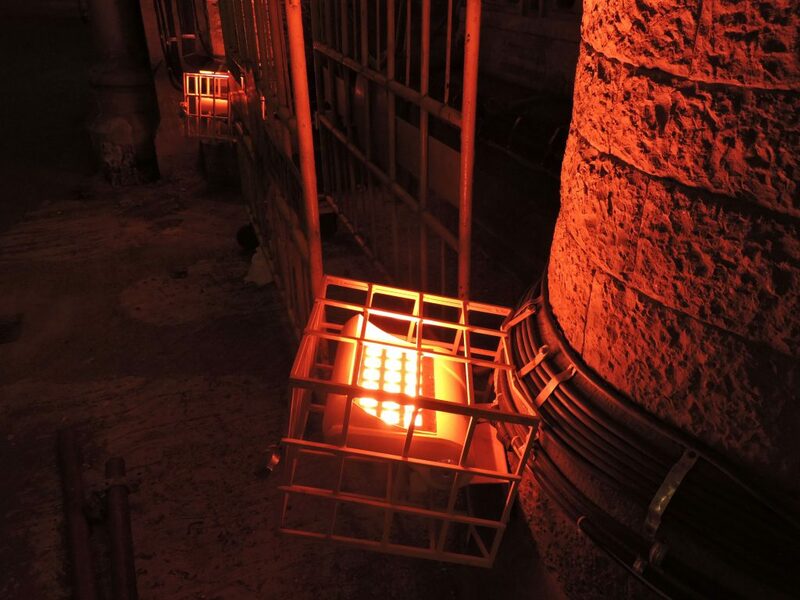 The color temperature in platform at night was about 6300K, and the lux level was uniform with 200 lux Internally illuminated signage was easy to understand, though high color temperatures, bare metal frames and digital sings had an impersonal feel. Platform structured with a large roof. 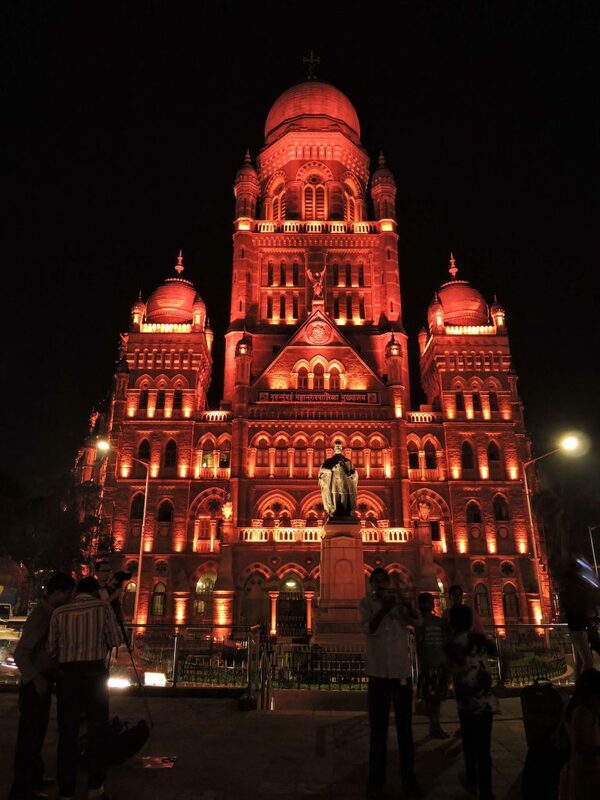 At night in Mumbai. There isn’t any lighting for façade other than pole lighting. At night in Navi Mumbai. Mixed-used facility of shopping mall and a hotel with vertical line lighting can be seen from the distance.